The club has two porous macadam courts. There is adequate parking beside the tennis courts. There is also a small clubhouse with a small kitchen area and w.c. This is a good time for potential new members to mix in with existing members. We operate a rota, with play limited to six games, with a tie-break at three games all. At the end of the six games, players who have sat out will feed into the next rota. Doubles play has priority, although singles play will be allowed, if all members present are in agreement. 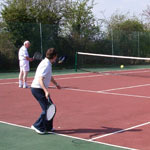 In addition to the club sessions, courts may only be reserved for matches and in-house tournament ties. 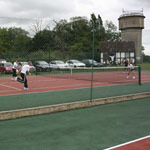 As the courts are solely for tennis use, this means that they are frequently available out of these times.